One thing London has a lot of, is tourist attractions, from the fun, the adventurous, the ones for kids, the ones for museum lovers and everything in between. That’s why its important to find the right one for you and to buy the best and cheapest tickets around. We will try to help you by summarising some of the more interesting and worth while attractions with great money-saving deals in the following page. **** July 2018 update – The best package that combine attraction tickets today in London is the Merlin’s Magical London that call also London Big Ticket. aal.londontheatredirect.com/attractions – website for musical tickets with good attraction page. At the 365tickets website look for the Combo offers. London Pass – A ticket that allows free entrance to a number of attractions and is well worth the money if you are planning on seeing a few attractions during your time in London, and if you use the code ASKALOCAL at time of checkout using this link you will receive a further 10% discount on your tickets for a limited time only. London is well know with it musicals and theatre, it is an experience you should have at least once in your visit. The large ferris wheel on the south side of the River Thames which was originally meant to be in operation for the millennium is still working and has now become one of London’s best known landmarks and is a great opportunity for any visitor to have a unique view over London while taking a rest from the many active attractions in London. The wheel opened in 1999 and used to be called the millennium wheel, although it has since been sponsored by several companies, changing every few years with previous sponsors being British Airways and EDF Energy, although these days it is sponsored by Coca-Cola and officially called the Coca-Cola London Eye. The London Eye is 135 metres tall, and was the tallest ferris wheel in the world when it was built, now it is still the tallest in Europe, there are 32 capsules rotating slowly around the wheel at a speed of 0.9 km/h. A full revolution takes around 30 minutes, plenty of time to enjoy the stunning London skyline and views of further afield on a clear day. Each capsule can hold 25 people, you have the choice of standing or sitting, with 360 degree views. The capsules are closed and have full working zircon and heating depending on the season. Due to the slow rotational speed of the wheel, boarding and departing the capsule happens while the wheel is still turning, but don’t worry, it is very slow. If however you in a wheelchair or otherwise incapacitated, the wheel will stop for your easy entrance and exit. This is London’s most popular paid for tourist attraction, with around 3.75 million visitors each year. There are many offers and deals available to combine a ride on the London Eye with other London attractions, such as Thames River Cruises, Dinner, a visit to Madam Tussauds, entrance to Tower Bridge, and more, which you can find here or here. Probably the world’s most famous wax work museum is in London next to Baker Street underground station and not far from the Sherlock Holmes museum on Baker Street. It is one of London’s most popular attractions and there is always something new to see, with the recent introduction of some of the most popular Star Wars characters. One of London’s recent additions is the making of Harry Potter tour, at Warner Bros Studio London, due to its popularity you may have to buy tickets well in advance, and definitely on-line to save time and money. You can find tickets including a bus ride from central London here. If you prefer you can buy a package that includes the tour and hotel here. The famous world of Lego has arrived in the UK, although not in London, it is situated not too far from Heathrow Airport and the beautiful town of Windsor, where you can also find Windsor Castle. LEGOLAND is a paradise for anyone who likes Lego, they update the park regularly and recently introduced a new Star Wars area. It is a great day out for the whole family, for kids young and old. You can find packages that include tickets and a hotel here. Looking for a different angle to see London from? Then look no further than a Thames River cruise with afternoon tea. This is a relatively short one and a half hour cruise, so leaving you plenty of time to see London’s attractions. During your cruise you will be served finger sandwiches, a selection of traditional cakes and of course with tea or coffee. For those who want to spice things up a bit, the boat has a bar where you can buy alcoholic drinks too. Boarding is at 15:00 from Tower Pier with the cruise starting at 15:30, you will return to Tower Pier at 17:00. Special offers and further details can be found here. Are you a fan of the Shrek movies and looking for something to do for an hour and a half? Then head over to DreamWorks Tours Shrek’s Adventure! London on the Southbank, next to the London Eye and close to both Waterloo and Embankment underground stations. Here you will travel through a magical adventure including a 4D movie, moving between scenes searching for Shrek. The kids will love it and there are enough hidden messages to keep adults entertained too. Tickets available here and here. This is situated at the top of 20 Fenchurch Street, called by many the Walkie-Talkie building because of the way it looks, you’ll understand when you see it as it resembles either a walkie-talkie or a cellphone from the 90’s. “The Sky Garden” by © User:Colin / Wikimedia Commons. Licensed under CC BY-SA 4.0 via Commons. On the 35th floor of this building, you will find the stunning Sky Garden, with its own bar and restaurant, and best of all, entrance is free! If you want to go, you do have to register at least 2 week in advance. 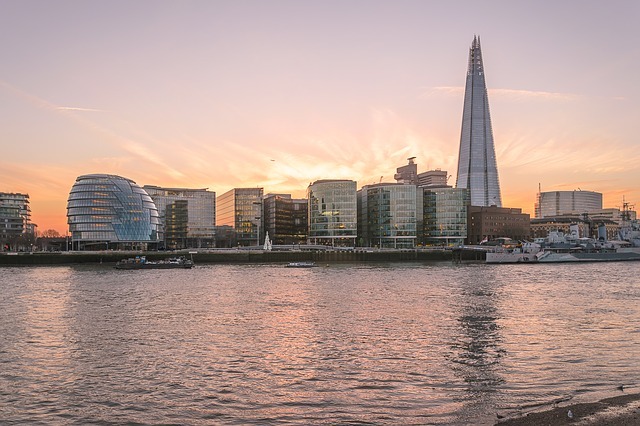 The Shard building is currently the tallest building in Europe, and the observation deck opened in 2013, it is one of the attractions that we recommend to end your visit with as you will hopefully know more about London and will be able to spot your favourite places from the top of this glass building. You can buy your tickets to entrance to the observation deck here and here. If you prefer you can buy a combined ticket for a river cruise and the Shard here. There are a few Ice Skating rinks that open up over the winter period in London, usually open between November and February, although there is also a permanent ice skating rink at Alexandra Palace in north London near Wood Green underground station on the Piccadilly line, which is also where the first TV signals in the UK were broadcast from. One of the seasonal rinks that is open every year is in Canada Square Park in Canary Wharf, this one is open until late February and you can find further information and special offers here. The museum is located on the Southbank of the River Thames, opposite St Paul’s Cathedral, and contains many famous artworks from modern artists. The museum has a few permanent galleries which display rotating pieces from its vast permanent collection, in addition to a number of other exhibits that change every so often. The best thing is that entrance to the museum is completely free of charge, although some of the temporary exhibits do cost. For more information and to see whats on display this month, please go to the museum’s website. The museum that was created to bring foreign culture to the UK, especially at a time before cheap air travel and budget airlines were easily accessible. The V&A is currently considered the largest cultural museum in the world, it has a number of permanent and temporary exhibitions, all circling a nice courtyard with a pond in the middle. General admission is free, although some of the temporary exhibits do cost money. You can see what is on display and which exhibits are free on their website. Opening times are 10:00 to 17:45 every day except Friday when the museum is open from 10:00 to 22:00. This museum is particularly recommended for families with children due to the impressive dinosaur exhibit, the rest of the museum is a bit old fashioned, but is being refurbished over the coming months and years. The museum has plenty to offer and you should check out their website for more, and like most London museums, general admission is free, although some exhibits may cost to enter. Normal opening hours are 10:00 to 17:50 seven days a week, with last entrance being at 17:15. On the last Friday of each month (excluding December), the museum has a ‘Lates’ evening usually between 18:00 and 22:00, where you can see the museum in a different light, where food and alcohol will be served and there is less likelihood for children to be running around. Entrance is free, although some of the special, Lates only, exhibits will require tickets. More information can be found on the Lates website. Entrance to the museums is free, with the exception to a number of movies and special exhibits as shown from time to time, and the museum is open from 10:00 to 18:00 with last entrance at 17:15 seven days a week, but be warned, some of the rooms start to close from 17:30, so best to arrive early. Check their website as on some Friday’s the museum is open late from 18:45 to 22:00. On the last Wednesday of every month the museum has a ‘Lates’ evening between 18:45 and 22:00, this is an adults only evening where food and alcohol will be available to purchase. Entrance is free, although some events may require a ticket. Every month there is a different theme from climate change, wartime scientists, childhood and more, check out the Lates website for full details. This is the museum for kids and adults with a great imagination, this is a museum of curiosities, with many new things to learn, it is also centrally located near Soho and China Town where you can stop off for lunch or dinner with many different restaurant options available. The changing of the guards ceremony at Buckingham palace is an impressive feat that brings in many tourists every year, therefore if you want to a good view, we recommend you arrive early, perhaps even an hour before its scheduled in order to be at the front and get a good look. The best place to see it from is either right up at the gates or from the steps on the Victoria Monument, as you will be higher than most of the crowds and are directly opposite the gates. If you don’t feel like hanging around for an hour, you can always come a few minutes before to feel the atmosphere of the changing of the guards, although be warned, you may not see too much, of course this will also depend on the weather, on a clear sunny day there are more likely to be more people in the area. In summer the ceremony is daily and in winter every couple of days, it is best to check the timetable before you go. There is no need to buy a ticket, just turn up and enjoy. The Royal Botanic Gardens at Kew (also known as Kew Gardens) were founded in 1759 and declared a UNESCO world heritage site in 2003. The gardens cover an area of over 300 acres (121 hectares), and have one of the world’s largest collections of plants. The gardens are big, and if you want to take them all in, we recommend between 4 hours and a full day visit, this way you can walk around the greenhouses, the beautiful trees, flower beds and water features. You must also try the Treetop Walkway, which is an 18 metres high, 200 metres long walkway amongst the trees in the gardens with spectacular views over the gardens. Further attractions, tours and ideas can be found at 365tickets.co.uk or at Expedia.co.uk. For more money-saving offers and links, please visit our dedicated London Deals page.